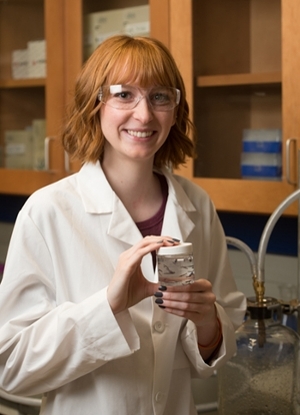 The Sigma Xi Grants-in-Aid of Research (GIAR) program has awarded $1,000 to Southern Illinois University Edwardsville’s Rachel Davis for her environmental, analytical chemistry research. Davis, of Galatia, is a senior chemistry major in the College of Arts and Sciences. Sigma Xi GIAR grants are highly competitive, with just a 15 percent acceptance rate. The grants are for small starter funds for projects initiated by undergraduate and graduate students with an average of $650 awarded. Davis’ research focuses on the detection of pharmaceutical and personal care products in the environment, such as waterways and surrounding soil. Davis has participated in SIUE’s Undergraduate Research and Creative Activities (URCA) as an assistant helping with the research of her mentor Kevin Tucker, PhD, assistant professor in the Department of Chemistry. This fall, she will be an URCA associate, which will provide the opportunity to lead her own research project. “As an URCA associate, I will be modeling the uptake of Endocrine Disrupting Compounds (EDCs) in Fathead minnows at environmentally relevant concentrations to determine the accumulation in the whole fish, and specifically in which tissues accumulation occurs,” she said. Tucker emphasizes Davis’ impressive list of research accomplishments as an undergraduate. In addition to her receipt of Sigma Xi GIAR funding and involvement in the URCA program, she has presented a poster at the Emerging Contaminants in the Aquatic Environment Conference in Champaign, and has been a co-author on two talks presented by Tucker. She has also co-authored four posters presented by other lab members in the past nine months. After graduating from SIUE in May 2018, Davis plans to attend medical school and later pursue a career as a physician. Photo: SIUE’s Rachel Davis, a senior chemistry major, has secured external funding for her undergraduate research. 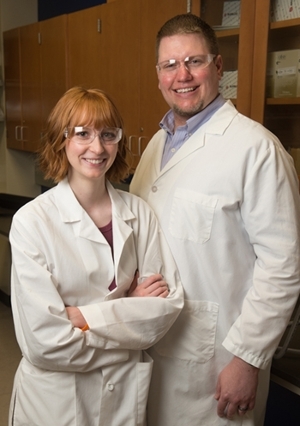 Rachel Davis (L) stands with her research mentor Kevin Tucker, PhD, assistant professor in the Department of Chemistry.